PLEASE READ THE DESCRIPTION CAREFULLY! FLUKE 233 DETACHABLE REMOTE DISPLAY DIGITAL MULTIMETER KIT. Model #: Fluke 233. Perform Two Man Jobs Alone. Now you can work in two places at once. With the new Fluke 233 Wireless Remote Display Multimeter you don’t need the help of another person when reading the display. Standing on ladders, tangling long test leads, or calling on a second person while testing are all now a thing of the past. Measure safely while placing the meter in hazardous areas, in clean rooms or near moving machinery. The Fluke 233 is a tool that will make your job easier. True-rms ac voltage and current for accurate measurements on non-linear signals. Measure up to 1000 V ac and dc. Measure up to 10 A (20 A for 30 seconds). 10,000 F capacitance range. Frequency to 50 kHz. Built in thermometer conveniently allows you to take temperature readings without having to carry a separate instrument. Resistance, continuity and diode test. Low power wireless technology allows the display to be carried up to 10 meters (33 ft) away from the point of measurement for added flexibility. No interference with measurements. The removable magnetic display can be conveniently mounted where it is easily seen. Make measurements without holding the meter to improve visual focus on probes and augment safe electrical measurements. Use as a conventional multimeter when the display is connected. Radio transmitter automatically turns off when the display is connected to the meter. Auto power off maximizes battery life. Min/Max and Average recording to capture variations automatically. Test continuity and diodes. Easy to read display with large digits and bright backlight. Battery life approximately 400 hours. 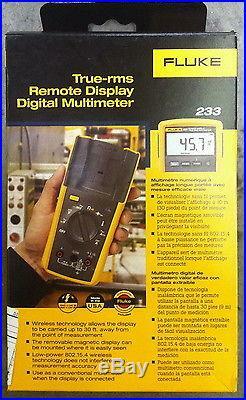 Fluke 233 Remote Display Digital Multimeter. Fluke TL75 Test Leads. Fluke 80BK-A Temperature Probe. Fluke AC175 Alligator Clips. Amp Jack Plug Set (2 Pack). 5 AA batteries (installed). 0.1 mV to 1000 V. 0.25 % + 2. 1.0 % + 3. 1 mA to 10 A. 1.5 % + 3. 0.1 to 40 M. 1 nF to 9999 F. 5 Hz to 50 kHz. 40 °C to +400 °C. CAT IV 600 V , CAT III 1000 V. Three for main body; two for display. 2.4 GHz ISM Band 10 meter range. CAT IV 600 V/CAT III 1000 V. Size (H x W x L). 5.3 cm x 9.3 cm x 19.3 cm (2.08 in x 3.6 in x 7.6 in). 604 g (1.3 Ib). We are extremely busy, so we might not answer your emails. Items will be replaced or exchanged in case of DOA. All packages will go out after the weekend or after the holidays. The free listing tool. Track Page Views With. Auctiva’s FREE Counter. The item “FLUKE 233 TRUE RMS REMOTE DISPLAY DETACHABLE FACE DIGITAL MULTIMETER NEW” is in sale since Sunday, October 25, 2015. This item is in the category “Business & Industrial\Test, Measurement & Inspection\Test Meters & Detectors\Multimeters”. The seller is “computer_psycho” and is located in Van Nuys, California. This item can be shipped to United States.